Gout is a metabolic disease characterized by frequent attacks of inflammatory arthritis with pain, redness and swelling of the joints. And 'it caused by the deposition of uric acid crystals in the presence of hyperuricemia. The joint most frequently affected is the metatarsophalangeal joint of the big toe (in about 50% of cases), hence the name of gout. Uric acid may also be deposited in the tendons and surrounding tissues and also in the kidney, causing gouty nephropathy. The diagnosis can be confirmed by detection of characteristic needle-like crystals in the synovial fluid. Treatment with nonsteroidal antiinflammatory drugs (NSAIDs), improves symptoms, solving acute attacks. Even in the absence of acute attacks should keep low levels of uric acid, by adopting changes in lifestyle. Gout was historically known as "the disease of kings" or the "disease of the rich." Today Gout affects about 1-2% of the Western population, a higher percentage than in the past. This increase is due to increasing risk factors in the population, such as metabolic syndrome, improper eating habits, life expectancy longer. Tanya Flynn, at the University of Otago (New Zealand), and colleagues analyzed data on 2,150 residents in New Zealand with gout clinically confirmed. Participants were interviewed about their eating habits. The researchers then analyzed the data collected on 12,722 subjects who participated in the Atherosclerosis Risk in Communities (ARIC) Study, the Cardiovascular Health Study (CHS), and the Framingham Heart Study (FHS). The analysis of the data revealed that consumption of tomatoes is linked to elevated levels of uric acid in the blood. 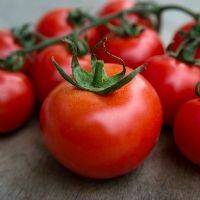 The study authors conclude that: "The association between the consumption of tomato and serum urate levels suggests that tomatoes can be among the foods that promote gout, after fish, alcohol, and red meat."